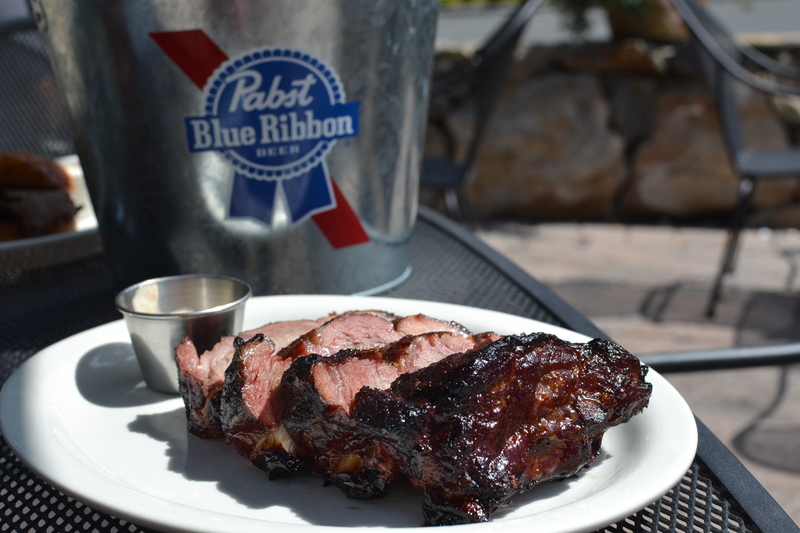 Wire Mill BBQ is located just north of Wilton’s Cannondale and south of Redding is the small area known as Georgetown. This cute section of town has several restaurants and bars, and it is Wire Mill that is filling the air with the wonderful aroma of its two meat smoker. 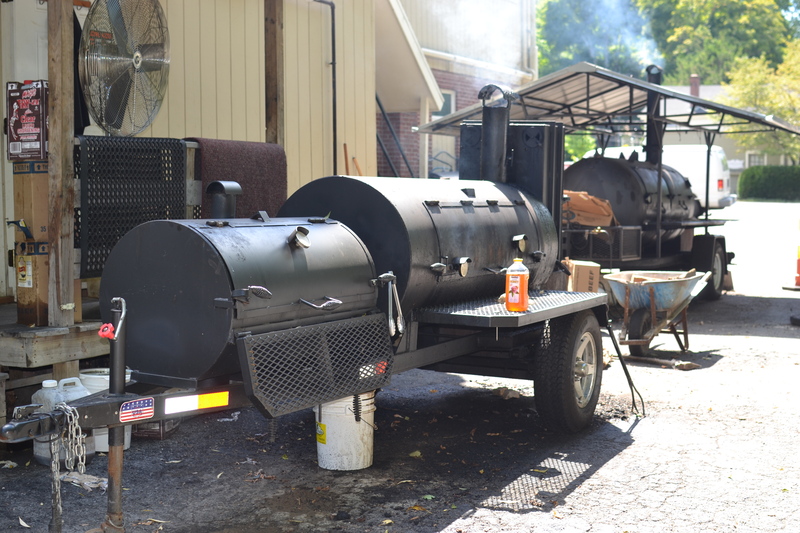 For those with the window closed, Wire Mill BBQ is located on Route 57 at the Interception of Old Mill Road and Main Street. There are eight table outside on the terrace and you continue inhaling the smoke. 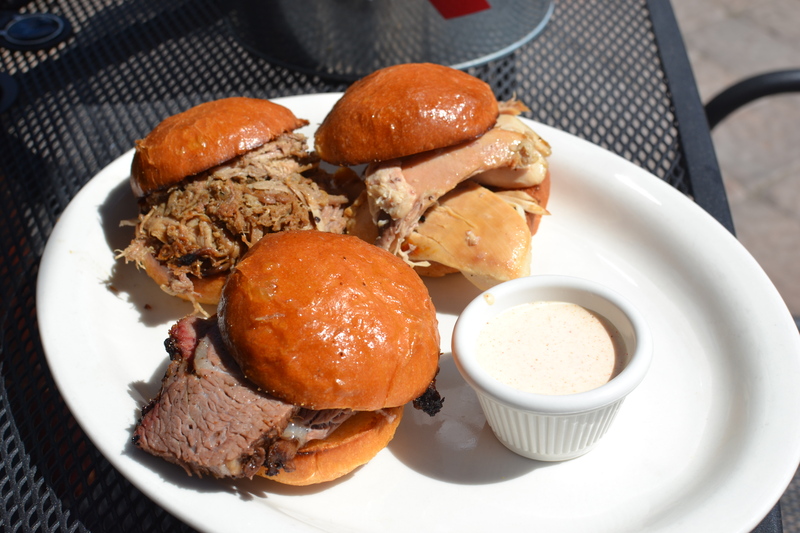 So enticing that when I ordered the Three Sliders (one each of the pulled pork, brisket and pulled chicken), I also ordered a ¼ slab of baby back ribs. The three sliders arrived, and the first item I noticed was the amount of meat on each bun. It was a meager portion, maybe one-ounce of meat. The bun was nicely grilled. The pulled pork was my favorite. It was somewhat moist, with a hint of smoke, but otherwise flavorless. It needed one of the sauces. The brisket was probably 1 slice, cut into sections and placed on the bun. There was a little smokiness that stayed on the palate but also lacked any flavor and sauce was needed. My first bite of the chicken was favorable, it was the moistest of the three meats, but that was limited to the original piece. The other pieces were dry and again, the only flavor was smoke. The other issue with all of the sandwiches was the amount of bread compared to meat. Take together it was a mouthful of bread with a little meat. I finally removed the top bun and ate each open-faced. The sliders were served with a small cup of horseradish sauce, which was full of flavor, but I have no idea why it was included. The baby back ribs looked delicious, but looks can be deceiving. They were incredibly moist, but again lack any flavor, barely able to taste any of the rub. Even the end piece of the slab, which was covered in rub, was almost flavorless. Overall, as much as this is a cute place with great service and two smokers out back, it is not a destination place for BBQ. That Awesome Deli & The Gluten Free Food Factory opened with very little fanfare a year ago and continues catering to the Belltown section of Stamford with breakfasts and lunches. With its entire menu available gluten-free, this unassuming side of the road storefront offers eggs, sandwiches and take-out options Mondays through Saturdays from 6AM to 4PM and remains open until 7PM on Thursdays. The simple breakfast options include eggs (egg white available), bacon, sausage, cheese, and peppers on GF white bread or bagel. For those not looking for a GF sandwich, several bread, roll and wedge options are offered. Lunches feature Boar’s Head meat and cheese products or choose from a variety on house-made salads including Albacore Tuna, Chicken Salad, Curried Chicken, Spicy Cajun Tuna, and Egg Salad. Top your selection with a choice of tomatoes, roasted red peppers, hot peppers, pickles, olives or pepperoncini peppers. When the weather turns, look to their seasonal soups including chicken noodle, tomato-basil or potato-bacon-cheddar, or a bowl of beef stew or chili. All of the desserts are made in-house. For parties, That Awesome Deli offers platters of Lasagna and other Italian specialties, Chicken (nine different varieties), steak teriyaki and beef or chicken enchiladas. For those looking for GF options, you may want to check out That Awesome Deli. Whenever I play golf up in Oxford I try to sneak off the route home and head to Gaetano’s for a hero. One of the reason I like this place is they do not call a hero a wedge. After playing through some horrible wedge shots, the last thing I want is a reminder when I am about to order a great sandwich. Call it a sub, call it a hero, just do not call it a wedge. If you want a great hot sub (called hot oven grinders in CT) go for the SAUSAGE & PEPPERS or the EGGPLANT PARMIGIANA. Both of these are full of great Arthur Avenue flavors. Again, two hands are required. Gaetano’s reminds me of the subs from my childhood in NJ, full of great meats and cheeses for a sub, and great hot choices for the heros. A good friend over at CTbites told me that the WC Burger served at Walrus + Carpenter in Bridgeport near the Fairfield border was the best burger in the area. Those are strong words from someone I trust so I drove one evening and grabbed an outside table. The menu is divided into several categories and each reads like a who’s who of comfort food. 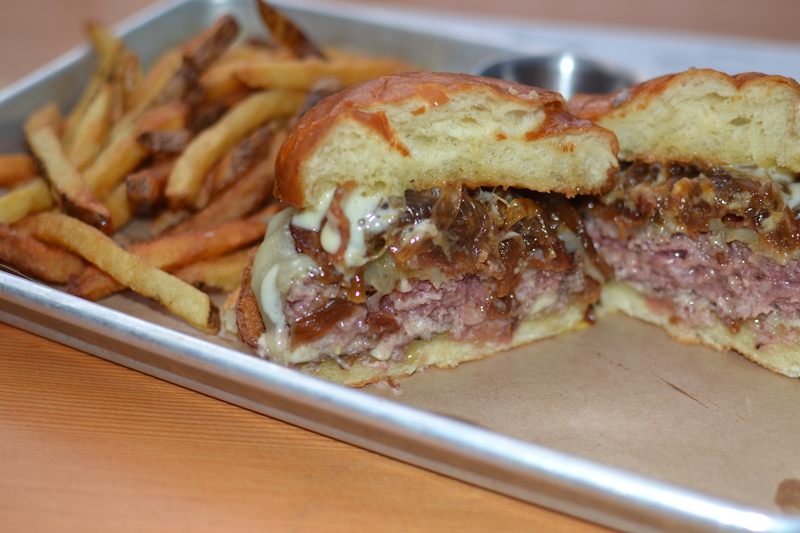 I was pleasantly impressed when I saw that the chef gave top billing in the Large Plates section to “WC Burger + Fries – Smoked mayo, bacon, bourbon onions, cheddar.” It was a simple decision and I ordered the burger medium-rare. The burger was served on a metal tray accompanied by fries and small mound of pickle slices. There was a crisp char on the exterior and the texture of the interior was soft. I sampled the meat; it was rich in flavor, reminiscent of grass fed, the medium grind was still loose and it was moist without being overly juicy. It was an excellent patty. The first topping I tasted was the Bourbon onions. W+C slowly caramelized the sliced onions until they were sweet and soft, added bourbon, and reduced until the bourbon was thick and concentrated. The end result was incredibly complex onion mixture; the sweetness of the onions interplayed with the condensed bourbon. These were some of the most delicious caramelized onions I have ever tasted. There were several strips of bacon, each mildly salty, allowing the pork to complement the onions and beef. The melted Cheddar cheese was creamy and added just a touch of nuttiness; and the mayo a smidgen of smokiness. The toasted brioche bun was the perfect choice for this combination. It was sweet, buttery and the slight crispiness from grilling was a bonus. One bite of this entire combination…it was outstanding and delivered great balance. This burger is highly recommended. The fries were excellent, crispy on the exterior and soft on the interior, with just a dusting of salt. From the meat to the toppings to the bun to the fries, my friend was correct, the W+C Burger is one of the best in Fairfield County. 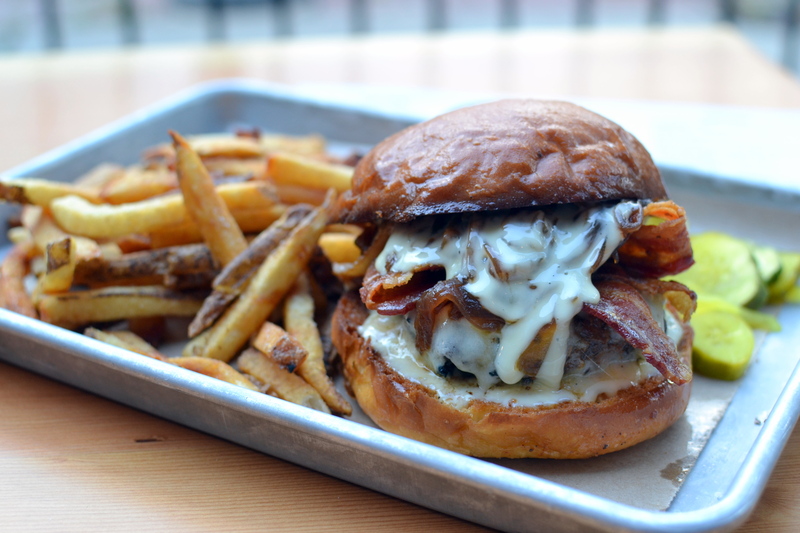 There is now another serious contender for best bar burger in southwest Connecticut. Washington Prime recently opened at the entrance to the SONO “Ironworks” on the corner of Washington and North Water Streets and is already garnering positive feedback and enormous crowds each night. CTbites offered a sneak peek a couple of weeks ago and recently re-visited this high energy and bustling establishment on two separate occasions to sample the food. Self-described as an Eating + Drinking Well, Washington Prime reflects the collective vision of locals and co-owners Rob Moss and Marco Siguenza. Moss, a native of New Canaan, is no stranger to opening high energy restaurants in Fairfield County, overseeing many over the last ten years. Siguenza is the epitome of the American dream, starting as a busboy at Match Restaurant and now 16 years later one of the owners of Washington Prime, a neighboring restaurant. 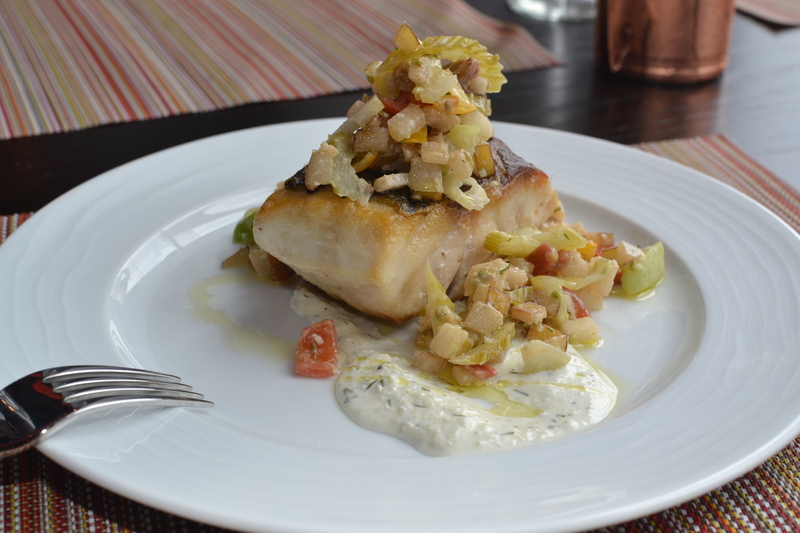 The kitchen is overseen by Executive Chef Jared Falco, classically trained at the French Culinary Institute. Before moving to Fairfield County, Chef Falco honed his culinary skills at Daniel and WD-50 in NYC. The trio are now working closely to present a vibrant bar scene with incredibly delicious interpretations of tradition cuisine. The N.E. CLAM CHOWDER was my favorite. The creamy base was smoky and filled with Little Neck Clams. Included in the presentation were sweet corn and small diced potatoes. The rich bisque was fully focused on melding the brininess of the clams with the smokiness of the soup. This was a great combination. 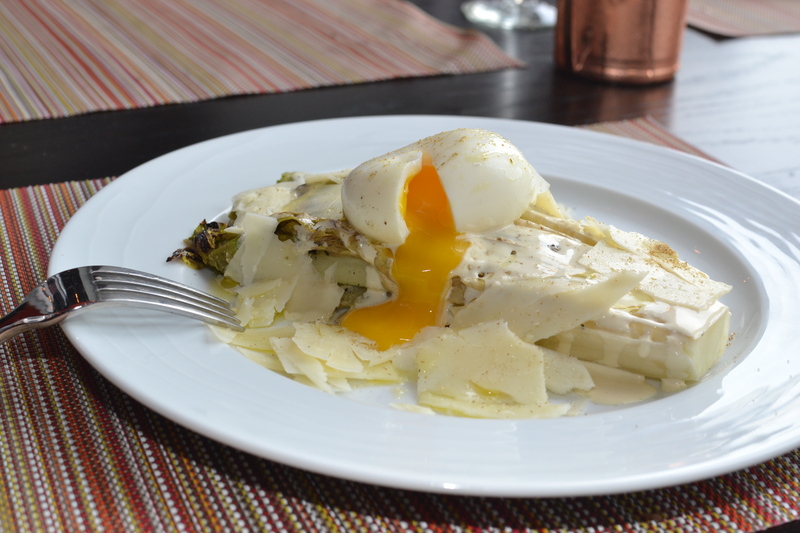 The GRILLED CAESAR was layered with charred Romaine, topped with shaved Landaff cheese, a poached egg, finished with black garlic Caesar dressing and a sprinkling of celery powder. Slicing the poached eggs released all of its creaminess, and created a great balance with the charred lettuce. The cheese was delicious, but it completely overwhelmed the other components. The BEETS were marinated and pickled, and mixed into arugula, chicken fried goat cheese, and topped with a blood orange vinaigrette. The beets were very tart and when combined with the blood orange vinaigrette increased this sour component, which overpowered the other ingredients. The OCTOPUS was my favorite of the Small Plates. It slowly braised for several hours and then grilled. 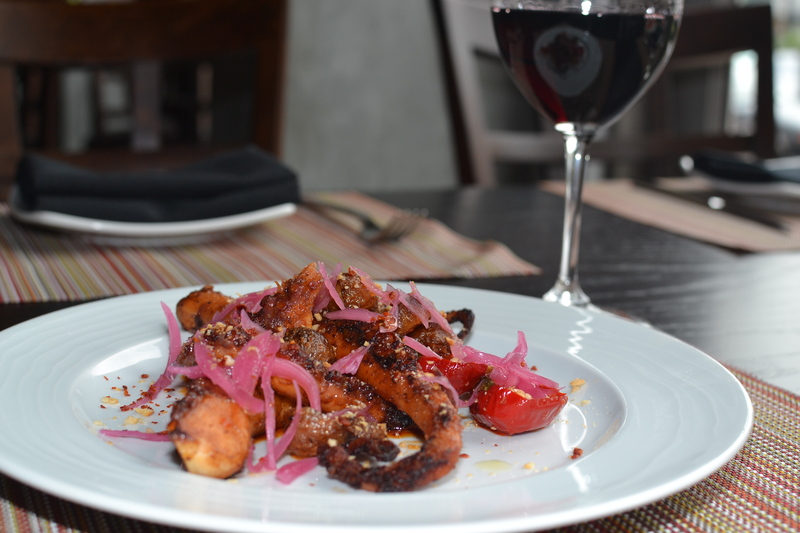 Joining the octopus meat were duck fat roasted potatoes, sliced pickled onions, and halved cherry peppers. The octopus was incredibly tender. Chef Falco elevated the spiciness of the dish with the inclusion of a pepper emulsion and the seasoned potatoes, which were soft and enjoyable. The onions added a touch of acidity, and guests have the option of increasing the spice level with the cherry peppers. 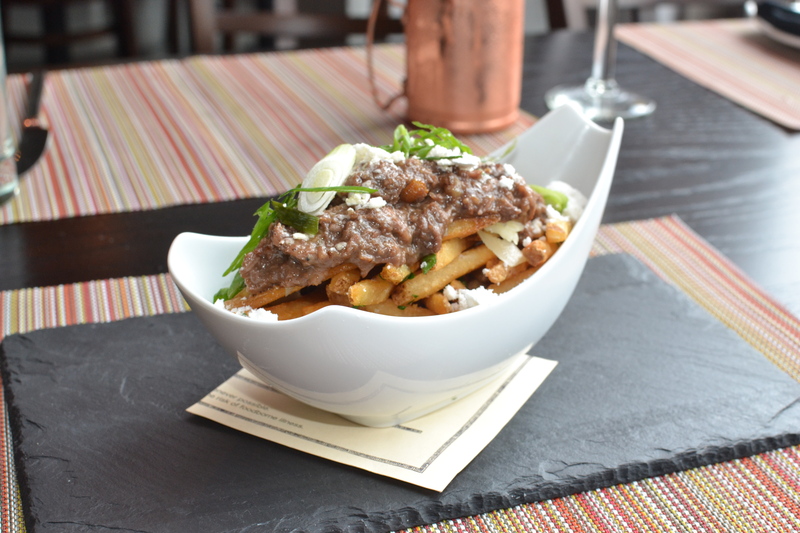 The POUTINE was served in an elongated bowl, beginning with crispy French fries, topped with the oxtail ragu, and finished with scallions and foie gras powder. The ragu was delicious, slowly braised and delivered a medium depth of flavor. The fries were crispy on the exterior and soft on the inside, and balanced the texture of the braised oxtail. The foie gras powder elevated the depth of flavor for the ragu, creating a wonderful combination. The scallions added a little more crunch and just a touch of pungency to this dish. The DEVILED EGGS started with slowly poached eggs, which were halved and filled with the yolks combined with Sambal, garlic, chili flakes and speck. 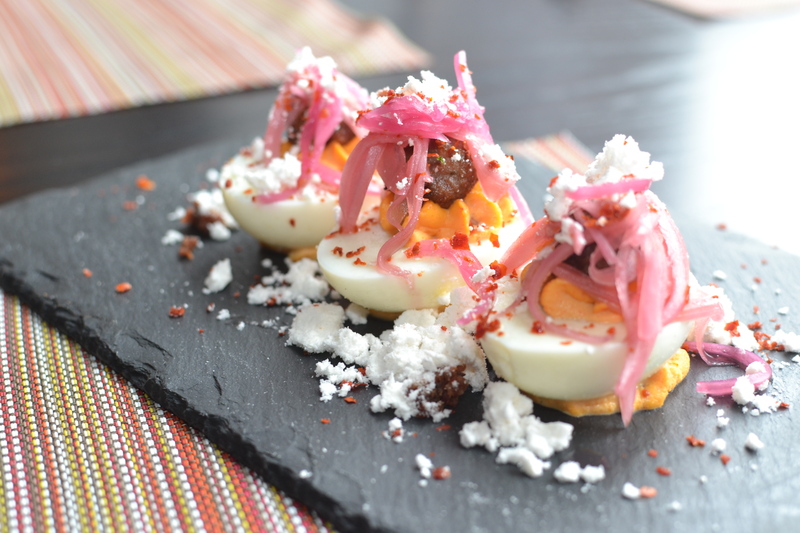 Nestled atop the yolk was a mini-meatball, then topped with a smattering of sliced pickled onions and foie gras powder. The texture of the egg white was soft and the slightly spiced yolk mixture was very good. The foie gras powder brought an earthy quality, and the bacon bits and the chili flakes contributed the saltiness and spiciness. The 18 OZ RIBEYE was incredible. 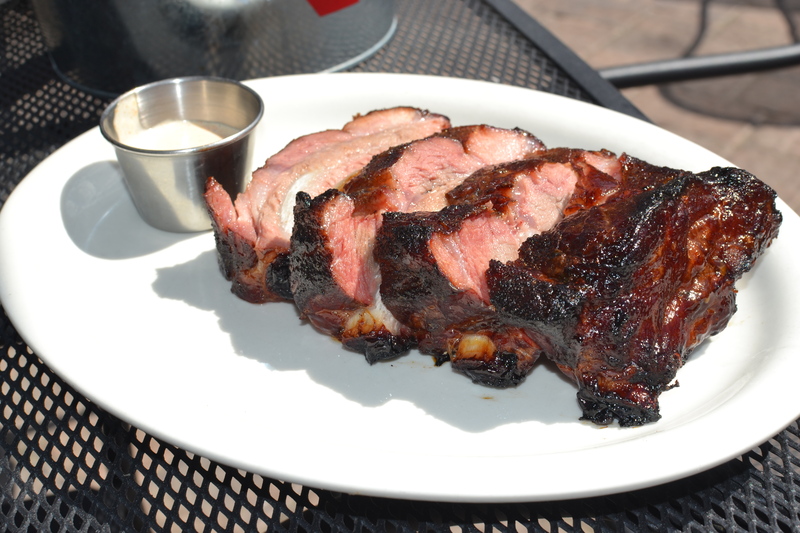 A Prime 18-ounce portion of Ribeye was simply seasoned with salt and pepper and cooked under a 900-degree broiler. The result was a perfectly seared, crusted exterior, while the interior was brought to the requested medium-rare. The first bite was mouthwatering in both flavor and texture. The steak was full of deep, rich, beefiness, it was melt in your mouth tender and delivered juiciness that made me smile with each bite. A wonderful buttery texture accompanied each tasty morsel. The PRIME BURGER started with a 3-cut blend ground beef from Saugatuck Craft Butchery, combined with a little dry-aged porterhouse. Chef Falco topped the patty with melted two-year old Vermont Cheddar cheese, a slice of mildly pickled Lucky Real Tomatoes, and shredded smoked lettuce. 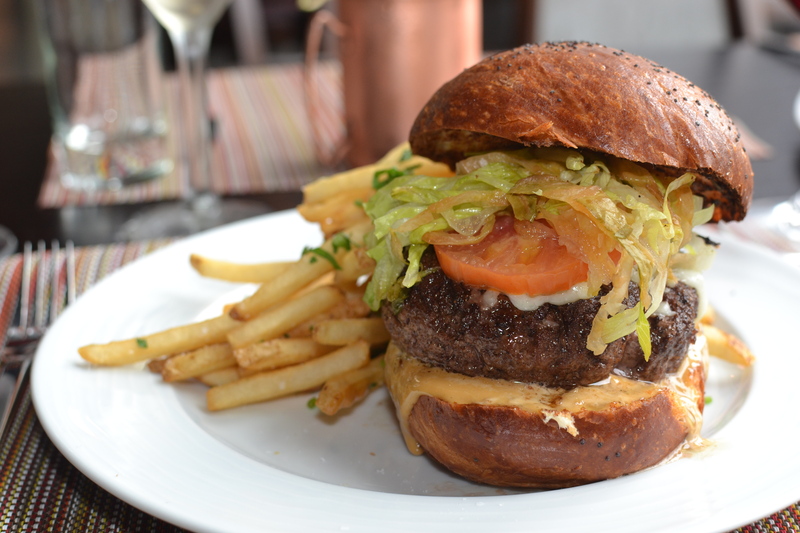 The burger sits atop an Umami Bomb sauce and encased in a Wave Hill brioche bun; served with a large helping of French fries. 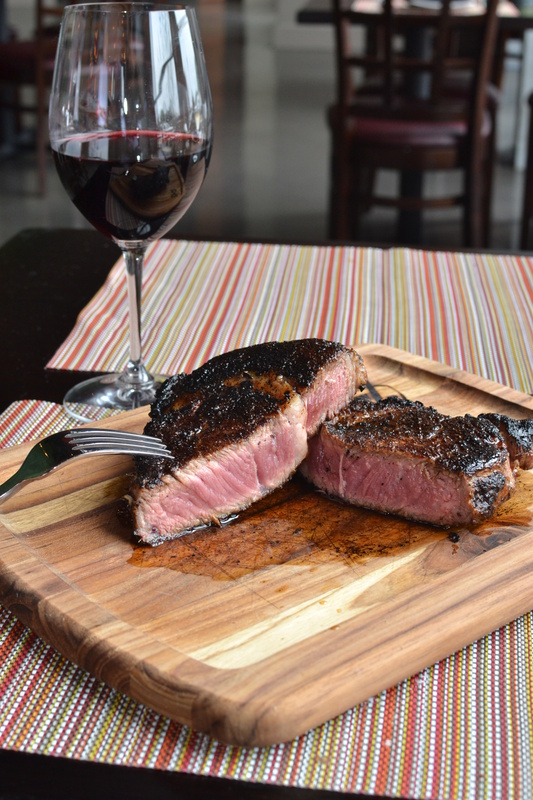 The addition of the aged porterhouse to the blend created a slightly deeper flavor. The smoked lettuce was an interesting twist, beautifully complementing the smokiness of the meat, and the cheese added a little creaminess. The Umami Bomb Sauce (a mixture of soy, fish sauce and mushroom stems) was a new element and introduced earthy notes to this burger. It was fantastic and a competitor for CTbites’ “Best of…” list. Service could stand a little improvement. Our server was a little aggressive on upselling, somewhat inattentive and could use a deeper knowledge of the menu. 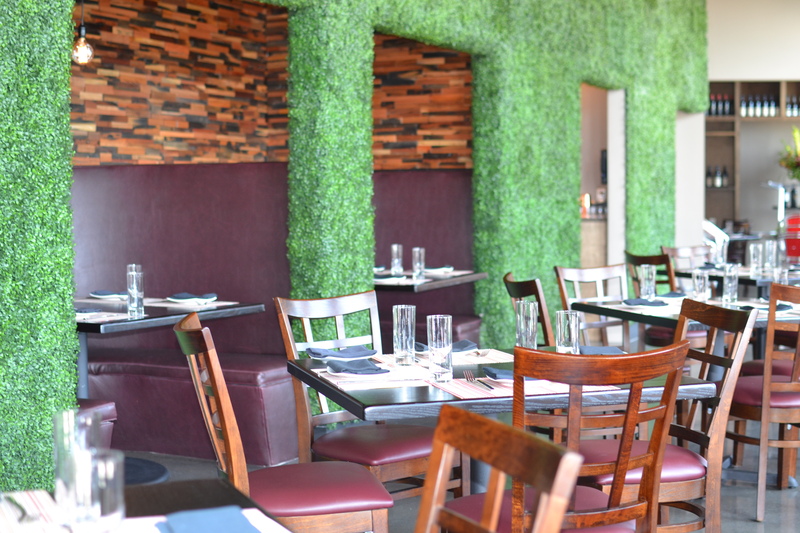 Overall, Washington Prime is an excellent addition to the culinary landscape in SONO. 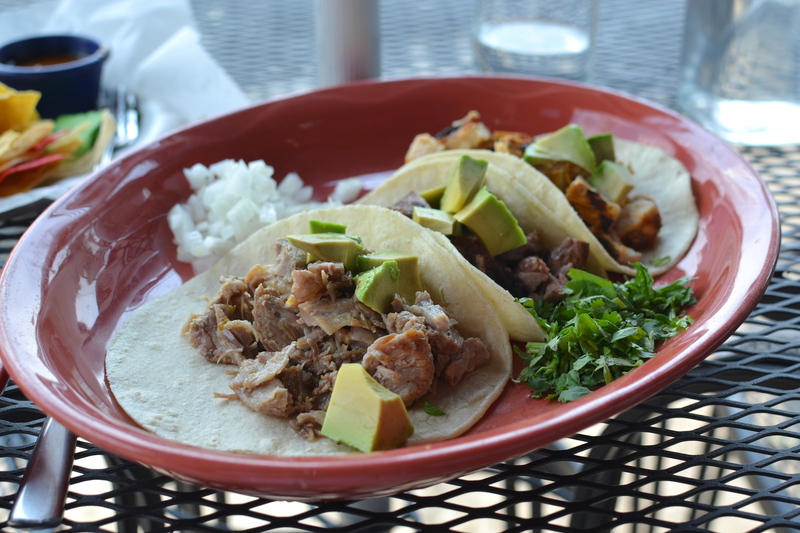 The taco craze is alive and well in Fairfield County and if you are looking for a large variety of tacos, and other Mexican inspired cuisine, head to Senor Salsa in Fairfield. 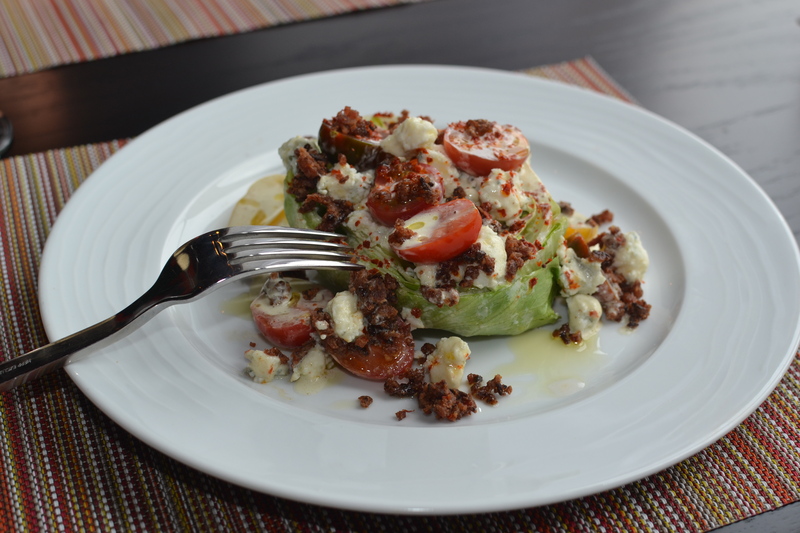 The menu begins with their Senor Salads where Romaine lettuce is combined with Cotija cheese, tomatoes and avocado and top with steak, shrimp or fish. Then move to one of four quesadillas ranging from a classic steak or carnita, or choose a vegetarian variety filled with a mixture of wild mushrooms, served with guacamole, sour cream and salsa. The taco choices focus on the sea, with mahi mahi or shrimp, or look to the land by adding chicken or a vegetarian taco filled with grilled red and green peppers, caramelized onions, black beans, and salsa. It is the Senor Burrito options that will grab your attention with ten different combinations. For the early risers, the breakfast burrito starts the day with eggs, chorizo, jack and cheddar cheese, avocado and salsa, or for the incredibly hungry diner, the overstuffed grilled burrito with a double portion of chicken, habanero jack cheese, salsa & guacamole, all wrapped in a tortilla and grilled (steak or carnita can be substituted for the chicken). And for those who cannot decide, order a combination platter and add a few chili rellenos to share. 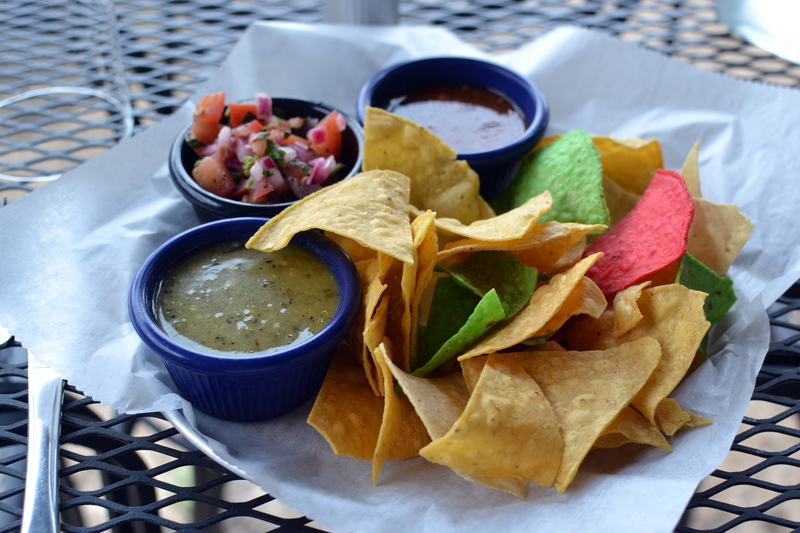 Senor Salsa offers a wide variety of choices, from a breakfast burrito at the beginning of the day to combination platters to share with friends as the sun expires. Don Carmelo’s is located in the same building as Subway and next to the Mobil Station on route 136 south of exit 16 off 95. Parking is located behind the building. You can chose to sit at the bar or grab one of 20+ tables inside or if weather permitting sit outside and watch the traffic pass and people fill their cars with gasoline. The menu on line is an exact replica of the menu I received. It is quite extensive and allows for plates of individual choices or you can choose to create your own combination. I was looking for a taco lunch, and ordered three soft tortilla tacos ($12), one each filled with steak, pork and chicken. Ordering as a combo includes rice and beans. As I waited, the server brought a plate of chips with salsa, green and red sauce. The salsa was very good, freshly made and full of flavor and the two sauces were both spicy and clean. I was hopeful for a good plate of tacos. When they arrived I had a different feeling. 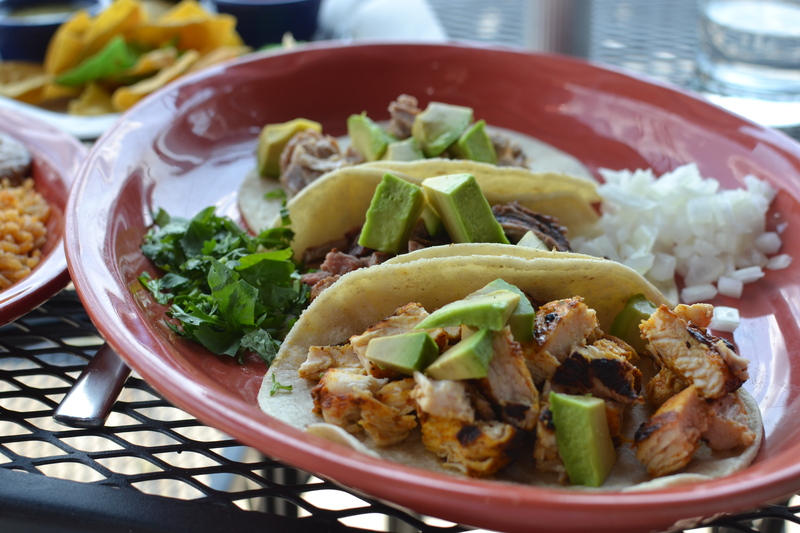 The 6” tortillas were each topped with grilled meat and a couple of cubes of avocado, nothing else. A little mound of chopped cilantro and a handful of diced onions accompanied the tacos. A separate plate contained half rice and half beans, sprinkled with a little cheese. This feeling was confirmed with a bite of each of the tacos; they were not very good. The pork was nicely prepared to maintain its juiciness, but had zero seasoning, and the steak was also cooked properly with just a dusting of seasoning. The polar opposite was the chicken that was overcooked and over-seasoned. A few bites of each and it was time to leave, no need wasting calories. The rice and beans were nothing special, basic rice and beans. Overall it was an incredibly disappointing visit with the food at Don Carmelo. The area has numerous place to enjoy some fantastic tacos, unfortunately Don Carmelo’s is not on my list.